The 2017 NHL Playoffs have certainly developed a much different landscape than 2016. First, only 9 of the 16 2016 Playoff teams returned to the postseason, and now only 4 of last year’s 8 Conference Semi-Finalists have advanced. Up ahead, we’ll explore some notable ticket trends in each of the series dropping the puck this week. The Capitals/Penguins matchup is a rematch from last season’s Eastern Conference Semi-Finals, and ticket prices for the series are down across the board. The Capitals playoff games in Washington currently start at $98 per ticket, a 10% decrease from last season’s “Get-In” price. Over in Pittsburgh, Penguins Playoff ticket prices are slightly below last season’s numbers as well as slightly below prices for the games at Verizon Center. The cheapest ticket available is $88, just a $3 drop from the 2016 Conference Semi-Finals. The Rangers look to once again establish themselves as Stanley Cup Contenders following an early exit in the playoffs last season to the eventual Stanley Cup Champion Pittsburgh Penguins. To little surprise, the New York market is greatly affecting ticket prices and the Blueshirts carry the most expensive tickets in the East. It’ll cost a minimum of $230 to get in the doors of Madison Square Garden for Games 3 and 4. For New Yorkers whom think a trip to Ottawa may be a better value… you’re half right. The cheapest tickets at Ottawa’s Canadian Tire Centre are just $86 USD, but according to Priceline.com it’ll cost over $400 for a round trip flight out of JFK. In a series that many anticipate to go 7 games, the Blues have home-ice advantage over Nashville, but the Smashville Faithful have immense confidence after easily dispatching the Conference Favorite Blackhawks in just 4 games. In fact, the Predators have the 2nd hottest ticket in the West, with cheapest seats costing $133. 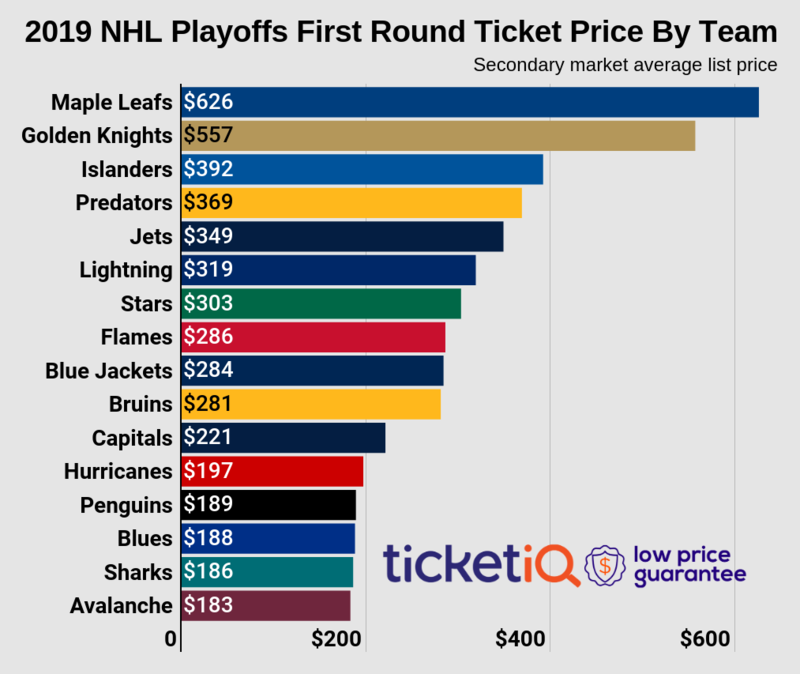 According to TicketIQ’s data, that’s over double the cost for Preds Conference Semi-Finals tickets vs the Sharks last season. Over in St. Louis, fans are instead treated to significantly lower ticket prices than last year’s Semi-Finals vs Dallas. With the cheapest tickets at Scottrade Center costing $69 on the secondary market, hockey fans in Arch City get a cool 31% discount compared to last season’s prices. After 5 Canadian teams made their way into the 2017 Stanley Cup Playoffs, only 2 have survived into the 2nd round. Edmonton will now represent Canada in the Western Conference, and much like the Opening Round of the playoffs, have the most expensive tickets of all teams involved. It costs a minimum of $249 to snag a ticket on the secondary market for Oilers Playoff tickets at Rogers Place, giving them the edge over the Rangers. For what it’s worth, it’s not much of an increase over their Opening Round prices, which saw cheapest tickets go for $228. Conversely, the Ducks have by far the cheapest tickets of the Conference Semi-Finals on the resale market. You can currently get in the door for less than $60, and $15 less than the next cheapest Conference Semi-Final team. Stay tuned to the TicketIQ Blog throughout the Stanley Cup playoffs for the latest ticket trends, and follow us on Twitter for exclusive discount codes!